What Might Be Wrong With the Ductwork? There are several possibilities, but the most frequent trouble is the ductwork has air leaks. Ducts can sustain damage from several sources, and in Florida one of the biggest troubles is high humidity. This can cause corrosion in metal ducts, and the development of mold and mildew can end up damaging plastic ducts and ductboard (a kind of thick paper board used for many ducts). Ducts in the attic can suffer damage from items stored there. The basic stress of air pressure in the ducts over time can also cause air leaks to begin. If the ducts were poorly installed in the first place (and this is an unfortunately common occurrence), there’s a much higher chance of wear on the ducts leading to leaks. A few air leaks in the ducts—doesn’t sound too bad, right? 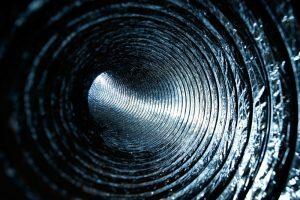 The truth is that leaks in air ducts are pretty bad, even if they’re small. Ductwork is designed to be airtight all along its length—this is how the ducts maintain the air pressure necessary to successfully move cooled or heated air from the AC/heater to the various rooms. Even a single small hole ruins the airtight seal and causes air pressure to drop. Consider also what happens to the air going out those leaks: it’s not ending up in the rooms. You’ve already paid to heat or cool that air, and it’s not entering the rooms but instead going into the attic or spaces between walls. You don’t want to pay money to heat or cool your attic! Up to 30% of the air moving through the ducts can be lost to air leaks, and that means spending a third more on heating and cooling costs. Duct sealing is a service only professionals can provide. (Leave the duct tape alone! This is not what duct tape is for.) Call us when you’ve got out-of-control HVAC bills. We’ll find the source and have it fixed. Call Touchstone Heating & Air Inc 24/7 for exceptional customer service! Serving the Communities of North Central Florida since 1998.